What if a skinhead shows up at a famed Holocaust survivor's office, not with a gun, but with contrition? What if said Holocaust survivor's prematurely dowdy, divorced assistant takes in the skinhead to hide him from the Aryan Resistance Movement he now says he wants to discredit? What if their story is told from close to each of their ambiguous human hearts? 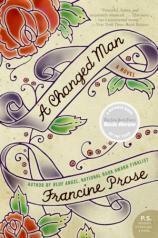 You have Francine Prose's new novel A CHANGED MAN, that's what. Vincent Nolan is the repentant skinhead, a good-looking (despite the tattoos) young man in his early thirties, fresh from camping on his cousin Ray's couch. Meyer Maslow, the celebrated, aging activist who directs a non-profit aimed at freeing dissidents and righting wrongs all over the world, has been expecting someone like him, all the more reason for Bonnie, his adoring assistant, to marvel at his prescience. Bonnie has channeled her feelings of rejection from the breakup of her marriage into intense belief in the rightness of Maslow's mission. When Meyer suggests that Vincent stay with her --- after all, he can't go back to his neo-Nazi cousin's couch, can he? --- she agrees with only a shiver of concern for her two young teenaged sons. Vincent talks a good game, and Bonnie wants to trust him, but she's a worrier by nature. She doesn't need the aggravation and feels guilty about it. And by that time, the reader knows that Vincent's duffel contains more in the way of dirty laundry than simply clothes: it also has a hefty supply of Vicodin, and $1,500 of drug money taken from Ray and his buddies. There are two main sources of tension in this accomplished novel by the prolific Ms. Prose. One comes from wondering whether Vincent really is a changed man, and Vincent, it seems, is as much in suspense as we are. The other comes from the author's convincing revelations of each character's hopes, fears, self-doubts and petty vanities. While she visits nearly all of the main characters' heads, she does so one at a time, and thoroughly evokes their distinct voices and thought patterns as they mentally skewer each other and themselves. The writing is crisp and witty. Here's Bonnie, on Maslow: "Meyer insists on having it all at once: history, God, and expensive clothes. He demands his right to wear Armani while using a mystical tale from Rabbi Nachman to make a point about former Soviet bloc politics or hunger in Rwanda." The narrative builds to several interesting climaxes. Vincent turns out to have a flair for public speaking and becomes kind of a weird father figure to Bonnie's two boys. Bonnie and Vincent contend with the nature of their growing affection for each other and with Vincent's allergy to nuts. Maslow wrestles with his own ambition and his jealousy of the younger man. The ending is satisfying without being sentimental. Not a book about fairy tale transformations, A CHANGED MAN examines each character's capacity and motivation for doing the right thing, and the sometimes tenuous moral reasoning they use to figure out just what that is.